After updating my samsung galaxy S8 through an OTA update of November 2018, I am constantly getting an error popup which shows “IMS service has stopped” and there are two options Close app and send feedback but non of them works it’s keep poping up after every few seconds, because of that i am unable to use my mobile so i contacted samsung customer support they says Go to Setting>Apps>Click on top right three dots>Reset app preferences but this method does not work. Other option he told me go to Setting>Apps >Messages>Storage and clear data and cache but even this method does not worked for me. After that he was unable to solve my problem. 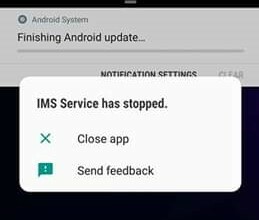 Even samsung’s customer support unable to solve this error so i got frustrated and started using my mobile with IMS service has stopped popup and after using it several hours magically it’s disappeared and eventually i got rid from this problem.